Whether you're General Mills or a mom-and-pop shop, vendors seem have a knack for faster deliveries and for turning custom designs into off-the-shelf offerings. When it comes to acquiring the latest technology, the biggest food companies in the world obviously wield a lot of power and influence with equipment vendors. But it's only a matter of time until everyone can benefit from the innovation that comes from such partnerships. With that in mind, some of the best news for all cereal and breakfast food processors came on Feb. 1, when Cereal Partners Worldwide, Nestlé's and General Mills' joint venture, officially opened a new innovation center in Orbe, Switzerland. In addition to support for product development, technology development and nutrition research, the new facility will offer "focused technical assistance for European manufacturing facilities" (there are 14 of them) and enable "collaboration and the exchange of best practices in development and manufacturing," says Mayank Patel, vice president of R&D and nutrition and regulatory affairs for CPW. 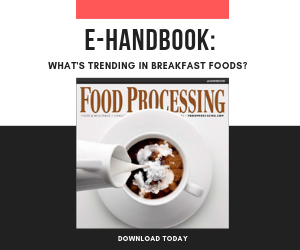 Because the global cereal giant wasn't about to open its processes to the world, we turned to equipment manufacturers to offer insights on the latest developments in producing foods for the breakfast table. Their innovations and strategies cross many areas of food processing. And while a multibillion-dollar Nestlé or General Mills or CPW obviously has the ear of any suppliers, smaller processors, too, benefit from close relations with their vendors for better, smarter, faster solutions and service. Vendors who listen to their customers find new opportunities for growth – like the Mexican food processor that saw a market opportunity to expand its product lineup by producing breakfast burritos. Early on, they discovered that individually quick-frozen (IQF) eggs "are extremely difficult to portion without destroying them," recounts John McIsaac, strategic business development for Robert Reiser, Canton, Mass. What should you expect of your machinery supplier? "We provided this customer with a couple of double-screw machines, with the right pumping configuration to give him his exact weight and preserve that egg's identity," he says. Other fillers have difficulty pumping accurately, which causes issues in assembling complicated products. Additionally, the portioner's double-screw design reduces excessive compression of non-folded products for something relatively close to "a more homemade appearance, as if someone lifted them out of the pan," McIsaac says. He adds that this solution has been "a success story we've repeated over and over" at multiple companies. This system along with others that help processors meet consumer demand for convenience are making for "another good year for breakfast food equipment," says McIsaac. Other successful systems include English muffin dividers, cheese slice depositors and higher-throughput sausage-making systems. This is in keeping with McIsaac's comment a year ago in these pages that Reiser has seen "a big increase in our business for machines related to breakfast sandwiches." Vendors improve upon standard designs all the time to meet customer requests. And once a new feature is added, it doesn't matter if a large or small processor drove the idea, it's available to all. A company will get repeat requests for a variety of custom add-ons. These include safety gratings; special ports on vessel covers (to accommodate feeding); pneumatically actuated covers; machine controls; choppers (for agglomerated powders); and spray bars (for adding minor ingredients). Nestlé's and General Mills' joint venture, Cereal Partners Worldwide, opened its new innovation center in Switzerland to advance its efforts to develop ready-to-eat cereals. The emphasis remains on the ongoing, global trend toward more whole grains and fiber and less salt, sugar and saturated fat. This is in keeping with the venture partners' membership in International Food and Beverage Alliance, one of whose main commitments is to "reformulate products and develop new products that support the goals of improving diets." While mass marketing has its limits – different locales require different marketing approaches – the industry has "a consistent definition of healthy" on a global scale, says Mayank Patel, vice president of R&D and nutrition and regulatory affairs for CPW. "The awareness of the health benefits of cereal may vary from region to region," he says, which presents CPW the challenge and opportunity to "educate consumers in emerging markets about why cereal is one of the healthiest breakfast choices a person can make." Custom fabrication takes time, yet "significant numbers of off-the-shelf orders from customers demanding fast delivery," says Christine Banaszek, application engineer for Charles Ross & Son, Hauppauge, N.Y. The company satisfies demand for fast delivery two ways. First, by stocking a broad line of standard and sanitary systems to give people more options when buying from inventory; and by turning popular custom-options into standard offerings. One specific ribbon blender feature – a built-in discharge extruder at the bottom of the blender trough – is something Ross "used to build only for custom units but we're now starting to introduce as a more standard design," Banaszek says. It consists of an independent, direct-drive screw that runs forward during the discharge cycle and in reverse during blending. She says the feature "eliminates dead zones, enhances mixing and offers increased control over the discharge rate." The company expects high demand for wet applications including extruded ready-to-eat cereals. A die assembly can be used for extruding viscous materials. Gentle handling and retaining the integrity of mixes are key requirements for many processors. Key Technology, Walla Walla, Wash., introduced a horizontal motion conveyor that uses a different, rotating-mass drive technique to slide products along. Instead of lofting or bouncing products along as a vibratory conveyor does, the pan (conveyor surface) moves forward gently to convey the product, and then slides back under the product, too rapidly for the product to slide backward – and again cycles to slide the product gently forward. "It's the inertia of the product and its frictional characteristics that allow it to be conveyed in that fashion," says Steve Johnson, product marketing manager. He compares the technique to the "magic trick" of yanking the tablecloth from the dinner table without disturbing the dishes. The gentle, sliding motion of a horizontal-motion conveyor might be ideal for moving raisins, granola, nuts and grains along in a granola blend without risking that the parts will separate. "This gives you strong assurance that within any given package, you're going to get very accurate results in a blended product," Johnson says. Vibratory conveyors, in contrast, can be used for just that – separation and grading. Additionally, vibration, not horizontal sliding, would be more appropriate for conveying a honey-coated cereal that would otherwise stick to a conveyor surface. There are of course many conveyance methods and vendors. Another one specializing in gentle, accurate handling of bulk wet and dry foods notes, "You can't afford to break materials – we hear this from everyone we're working with," says Karl Seidel, marketing manager at Cablevey Conveyors, Oskaloosa, Iowa. The company's tubular drag conveyors use a closed-pipe design with internal flights to pull product along while also retaining accuracy in mixes. Being enclosed keeps foreign matter out – that's a big food safety advantage over open conveyors -- and accommodates clean-in-place, as well. "Sanitary [processing] is no longer an option," Seidel continues. "Current trends indicate that if you're a food processor you need to pay attention to what's going on or you'll be investigated." And oversight will only get tougher in the months and years ahead, he adds. Integration is an area where equipment manufacturers pick up the slack for dwindling in-house engineering staff. Services can range from turnkey management of control systems on a line to informal solutions. For example, the story of the Reiser's IQF breakfast burrito didn't end with the installation of the double-screw egg depositor. It was so popular that the vendor didn't just sell a bunch – it did some extra engineering to mate the depositor to machinery from Solbern (www.solbern.com), whose dough folders are popular for Mexican tortillas, Asian rolls, Jewish-style blintzes and the like. "It's not a formal partnership, but we worked with them to develop depositing systems to work with their folders at our customers' sites," McIsaac says. At the other, more formal end of the "services" spectrum, vendors offer all manner of assistance when a food plant is adding or automating a line. Key Technology unveiled its Integrated Systems Group (ISG) late last year as "a response to customer requests to provide more integrated solutions for them," Johnson notes. The scope of service includes Key's sorting, conveying and processing systems as well as outside mechanical and automation suppliers. Additional services include online training and even remote, web-based diagnostics and monitoring of equipment installed at its customers' plants. This allows Key tech-staffers to monitor equipment "and provide that information back to the user to tell them how well their machinery – our machinery – is performing. That's one way we try to assist their in-house maintenance effort over the long haul." Ross & Son's Banaszek sees small, specialty food companies facing growing pains as they seeking a switch from contract manufacturing to in-house blending. At first, she says, "They turn to us to rent or purchase a blender," then "a matter of weeks or months later, many respond to successful trials and increasing demand by coming back for larger units," which has driven the company to expand its blender stocking program. Summing up how consumer trends drive processor and ultimately vendor requirements, Vin Faherty, product manager for Harpak-ULMA Packaging, Taunton, Mass., says convenience demands have his customers "looking for more convenience in packaging" adding environmental concerns and nutrition and labeling information as key areas where solutions are needed. Within the next few years, he says breakfast foods will continue trending toward "healthier more nutritious meals, quick and easy convenience [and] portability." Additionally, he sees advances with cook-in microwavable packaging and "packages that are easy to open and convenient for storage." Adding to Faherty's predictions, Heidi Harfinger, vice president of marketing for Harpak-ULMA, sees processors focusing to meet challenges on several front to reduce costs and increase efficiency. "The emphasis is on driving costs down by managing down time due to changeovers, run outs and equipment failures," she says, noting that plants continue to enlist vendors' expertise to help improve their processes.